In addition to the vertical takeoff and landing (VTOL) craft hinted at last month, Aerosense on Monday exhibited a quadcopter that makes use of Sony’s lens-type camera, the QX30. Designed for use in urban areas such as construction zones, the AS-MC01-P quadcopter weighs about 3 kilograms (6.6 pounds) and can fly for about 15 to 20 minutes on a battery charge. 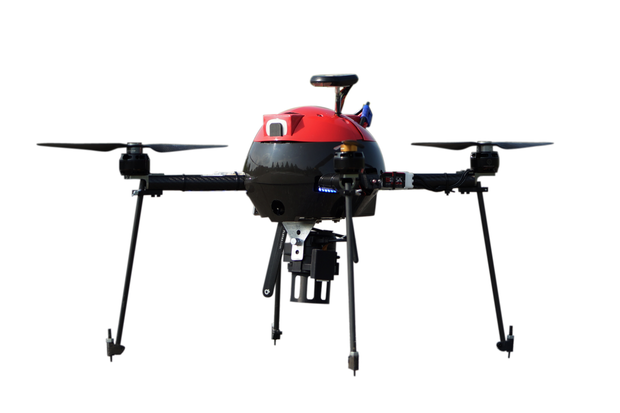 It can operate autonomously, flying within a preset zone, and is equipped with GPS, Wi-Fi and an inertial navigation system. It also has a high-speed data transfer module that uses Sony’s TransferJet technology. The venture’s other craft, the AS-DT01-E winged VTOL drone, has a rotor system that allows it to fly like a helicopter or a plane. The advantage of the winged format is that it can fly at much higher speeds than most non-military drones — up to 170 kilometers per hour (106 miles/hour) compared to high-speed quadcopters that fly at 75 kph (47 mph). Weighing 7kg (15 pounds), it can carry a 3kg payload (6.6 pounds) and operate for at least two hours on a battery charge. Sony wants to use its smartphone technologies such as cameras and networking know-how to give Aerosense an edge. Sony Mobile Communications owns just over 50% of the venture, with the rest in the hands of Tokyo robotics firm ZMP, which set up a robot taxi company earlier this year along with mobile gaming giant DeNA. Sony also has robotics resources that it is putting into the drone business. Aerosense’s CTO is Kotaro Sabe, who worked on the electronics maker’s Aibo robot dog and Qrio humanoid robot, both of which were shelved when Sony shut down its entertainment robot business about 10 years ago.